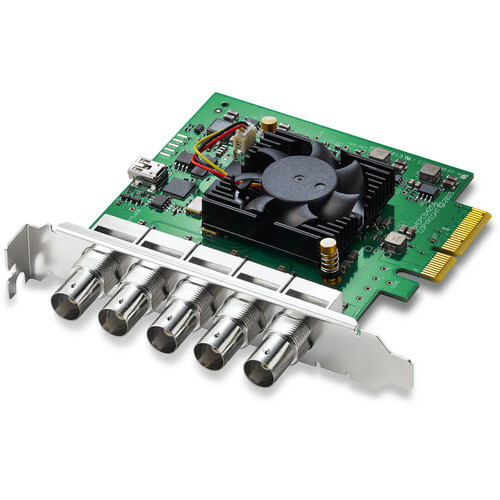 DeckLink Duo 2, a new high performance capture and playback solution with 4 independent channels that can be assigned to either record or playback in any combination, all on a single plug in PCI Express card. Designed for developers and OEMs, DeckLink Duo 2 is the ideal solution for media play-out servers, multi screen digital signage servers, real time processors and more This new model of DeckLink Duo 2 features 4 independent 3G-SDI connections so it can now work in high HD frame rates and it supports SDI formats in SD and HD up to 1080p60. Each SDI connection is completely independent, meaning that each of the 4 connections can input or output entirely different video standards and content streams, all at the same time. DeckLink Duo 2 can also capture and playback at the same time, and also includes a reference connection for black burst/tri-sync. Developers can use the SDK to configure the four SDI connections to be any combination of inputs and outputs. Featuring high performance 4 lane Generation 2 PCI Express, DeckLink Duo 2 takes up only one single PCI slot in the computer, which makes it the perfect solution for system integrators and developers that need completely customizable, flexible I/O configurations on a single card. DeckLink Duo 2 appears as 4 independent SDI cards to the host computer, even though it only uses a single PCI Express slot and is ideal for use in servers that need to handle multiple video streams for both simultaneous.